The life of Satou Kazuma, a hikikomori who likes games, all too soon came to an end because of a traffic accident...... It was supposed to, but when he woke up, a beautiful girl who called herself a goddess was in front of his eyes. "Hey, I have got something a little nice for you. Wanna go to another world? You can take only one thing of your choice along with you." "... Then I'll take you." From here on, the great adventure of subjugating the Demon King will begin for the reincarnated Kazuma...... Or so one would think, but it's the labor for obtaining food, clothing and shelter that begins! 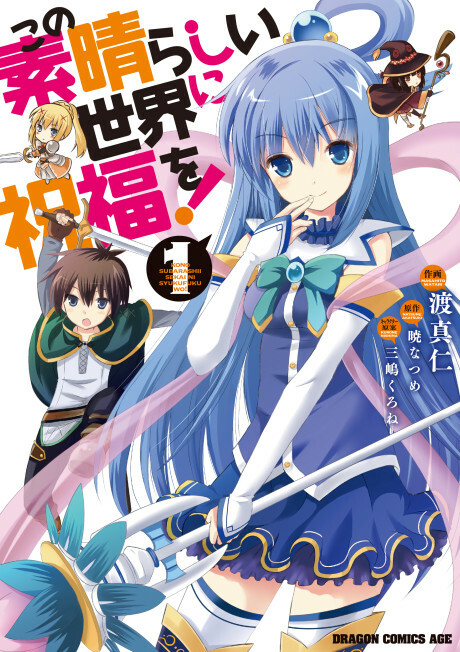 Despite Kazuma wanting to live in peace, the goddess keeps causing problems one after another, and eventually, they attract the attention of the Demon King's army!? Kono Subarashii Sekai ni Nichijou wo! Kono Kamen no Akuma ni Sodan wo! Kono Subarashii Sekai ni Shufukufu wo! Kappore!